With Tuesday's No. 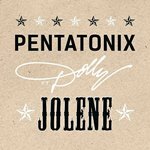 18 debut of "Jolene"with Pentatonix this week with 18,000 downloads and 2.6 million U.S. streams, Dolly is now the only artist to score top 20 or top 40 hits on the country singles chart in all six most recent decades – the '60s, '70s, '80s, '90s, '00s and '10s – according to the lead online story on Billboard's website here Wednesday. The only other artist who could match this feat would be if Willie Nelson, who has had a top 20 in each of the first five decades but not in the 2010s, earns another top 20 by Dec. 31, 2019. Both he and Dolly are featured artists – and co-writers – of this week's No. 1 mash-up "Forever Country" but because it is credited to "Artists of Then, Now & Forever" instead of the 30 participants' actual names, the song does not count toward any of their totals for chart performance. The article noted that George Jones is the only artist to have chart singles in all seven decades of the chart, having also charted songs from 1958 through 2013. Dolly scored her first chart single on the magazine's Bubbling Under the Hot 100 pop singles chart in 1965 when "Happy, Happy Birthday Baby" went to No. 8, and her first country chart single followed 15 months later in 1967 with No. 24-charting "Dumb Blonde." Her total of 74 top 20 singles were nine in the 1960s, 33 in the 1970s, 27 in the 1980s, three in the 1990s, one in the 2000s and one in the 2010s. Dolly's Pure & Simple Tour continues to earn raves wherever it goes. Entertainment Today gushed about Tuesday's San Diego area engagement here and The Independent praised Sunday's Santa Barbara show here. The album she is promoting, Pure & Simple, earns seven-out-of-10 stars from Star 2 here. Also, Dolly's publicists on Wednesday officially announced her upcoming appearances on Monday on ABC's Jimmy Kimmel Live and CBS's The Talk. Dollymania.net revealed the Talk appearance on Friday of last week and the Kimmel appearance a week ago Tuesday. Amazon on Wednesday added a pre-order page for Dolly Parton's Christmas Of Many Colors: Circle Of Love DVD, which as has previously been reported here, will be released Dec. 20, following its Nov. 30 premiere on NBC. Get yours here! The Ripley's Believe It Or Not Museum in Gatlinburg is getting its own Dolly-themed piece of art. The Orange Observer reports that an artist who has had 15 pieces in various media displayed at different Ripley's museums over the years has a Dolly portrait made of several pieces of fabric from his grandmother's clothing in homage to Dolly's "Coat Of Many Colors" which will debut at the East Tennessee location in January. Read an interview here. Is it 1974? Because Dolly is at No. 1 with "I Will Always Love You" and in the top 20 with "Jolene." It was previously reported here that "Forever Country," the mash-up of "I Will Always Love You" with "Take Me Home Country Roads" and "On The Road Again" by 30 artists including Dolly herself, debuts on the Oct. 8 Billboard charts at No. 1 Hot Country Songs but what was news when the full charts came out on Tuesday was the a capella cover of "Jolene" by Dolly and Pentatonix debuts at No. 18 Hot Country Songs with sales of 18,000 copies, giving Dolly her first chart U.S. country single since "Jesus & Gravity" went to No. 56 in 2008 and first country top 40 since her most recent No. 1, "When I Get Where I'm Going" with Brad Paisley, in 2005. The Pentatonix collaboration also debuts at No. 37 digital song sales, No. 84 Canadian pop songs, No. 7 digital country songs, No. 17 digital pop songs, No. 4 streaming country songs and No. 1 Bubbling Under the Hot 100, meaning it is No. 101 pop and just missed entering the Hot 100 pop singles chart to make Dolly's first appearance there since "When I Get Where I'm Going." The popularity of the new recording also sparked interest in Dolly's 1973 original recording, which debuts at No. 1 on the Spotify Rewind 1970s streaming chart and No. 43 country digital songs tally. "Forever Country" rises six to No. 33 country airplay and also debuts at No. 3 Spotify viral streaming, No. 21 Hot 100 pop singles, No. 2 digital songs, No. 25 Canadian pop, No. 1 country digital songs, No. 2 Canadian digital songs, No. 45 Canadian country airplay and No. 1 streaming country songs. With sales of about 6,000 copies, Dolly's Pure & Simple in its fifth week dips one to No. 7 country albums and gains two to No. 106 pop albums, six to No. 30 current albums, six to No. 30 overall album sales and one to No. 6 Americana/folk albums while it slips 13 to No. 49 in its fourth week on the Canadian pop albums list. Very preliminary sales numbers from Hits Daily Double have it falling about a dozen places on the overall sales tally to No. 42 and down three to No. 10 country in its sixth week; their full projections will be final on Friday. With sales of about 1,400 copies, The Complete Trio Collection Deluxe falls off the pop albums top 200, down from No. 124, overall sales down from No. 40, Internet sales down from No. 13 and current albums own from No. 39. In its second week, it loses 20 places to No. 27 country albums and eight spots to No. 16 Americana/folk albums while My Dear Companion: Selections From The Trio Collection falls off the country albums tally, down from No. 44. Dolly's Pure & Simple Tour goes to Laughlin, Nev., on Friday, prompting The Laughlin Event Center to offer an overview of her current career here and noted that Tropicana Laughlin will follow up the night with a Dolly party Saturday featuring a Dolly drag contest here. Nashville Public Radio on Tuesday continued its coverage of flutist Deanna Little's Dolly Project to have area composers write chamber music inspired by Dolly and her "Coat Of Many Colors." A nearly half-hour program this week presented three of the compositions. Take a listen here. While doing media promotions for their The Complete Trio Collection Deluxe, Dolly and Emmylou Harris were interviewed by artist Laura Marling for her Reversal Of The Muse podcast that explores femininity in creativity. Hear the interview here. Dolly's "I Will Always Love You" is at the top of the country charts for a record third time, Billboard revealed on Monday, announcing that its mash-up with "On The Road Again" and "Take Me Home Country Roads" under the title "Forever Country" will debut this week at No. 1, just the third song in history to debut at the top of the country chart. The song also debuts at No. 21 pop on 93,000 downloads, 5.7 million streams and 5.4 million radio impressions. The popularity also gives "Country Roads" a 181 percent increase to about 5,000 downloads for the week, "On The Road Again" a 126 percent increase to about 2,000 downloads and "I Will Always Love You" a 314 percent increase to about 2,000 downloads. Dolly, who sings the final lines of the No. 1, took her original song to No. 1 in 1974 and a new recording of it to No. 1 in 1982 and as a duet with Vince Gill – who also sings a line of it in the new version – to No. 15 in 1995. Because the song is credited to "Artists of Then, Now & Forever," it likely will not count toward the official credited chart-toppers for any of the 30 participating artists. Read more here. Country Music Hall of Fame member Jean Shepard died this week at age 82 and Dolly on Monday remembered her friend with a video posted to Facebook here. Dollywood's National Southern Gospel & Harvest Celebration kicks off on Friday and runs through Oct. 29 with legend Sandi Patty headlining opening weekend Friday and Saturday. In a press release, Dolly said: "It's no secret I love singing about the beauty of God's coloring book and viewing the bright fall colors of the Great Smoky Mountains on His pages is so very inspiring. When you mix in all of that great Southern gospel talent, including Sandi Patty, this truly is a great time of year to visit my Dollywood." Patty added: "It is such an honor for me to be performing at Dollywood for this year's National Southern Gospel & Harvest Celebration. The vision that the legendary Dolly Parton has created in her theme park and Dollywood's DreamMore Resort is evident in the meaningful entertainment that is constantly offered. It is such a special opportunity to spend a few days at Dollywood during my Farewell Tour. I look forward to sharing some of the most well-known songs that I've had the privilege of singing in my career. We're going to have a great time together in worship." The complete performance schedule is available at Dollywood.com/gospel. My Dear Companion: Selections From The Trio Collection by Dolly, Emmylou Harris and Linda Ronstadt earns a second consecutive week at No. 1 on the Australian country albums chart, it was announced Sunday, with the collection slipping one to No. 4 pop albums and 27 spots to No. 35 digital albums. Also Down Under, Dolly's Pure & Simple inches up one to No. 5 country in its fifth chart week and slides one to No. 26 pop. "Forever Country," the 30-artist mash-up of "I Will Always Love You," "On The Road Again" and "Take Me Home Country Roads" including Dolly as the finale, debuts at No. 43 pop singles, while "Jolene" by Dolly and Pentatonix debuts at No. 92 pop singles (besting Dolly's own 1974 single week on the chart Down Under at No. 99 but not as high as Olivia Newton-John's cover in 1978, which went to No. 29, and Australian The Voice contestant Celia Pavey's 2013 version, which went to No. 15). Meanwhile, Dolly's Pure & Simple Tour blew through the San Francisco Bay area on Saturday and greater Los Angeles area on Sunday. The San Jose Mercury News reviewed Saturday's show here, while her recent Vancouver performance is reviewed by Vancouver Weekly here. Promoting the tour and album, Dolly chatted with Indianapolis station WISH here, and newcomer Cam gushed about her recent interview with Dolly for Cracker Barrel's album promotions here. The U.K. charts were released on Friday and Dolly's Pure & Simple last week sold about 2,500 copies there (giving it about 37,000 units moved in the U.K. since release) to hold steady at No. 2 country in its fifth week. The album slides six spots to No. 27 British pop albums, four to No. 18 overall sales, three to No. 15 physical CD sales, and one to No. 13 Scottish albums. Also in the U.K., The Very Best Of Dolly Parton, Volume 1 re-enters the top 100 physical CD sales list at No. 92, while The Real Dolly Parton holds steady at No. 86 physical CD sales. The Complete Trio Collection Deluxe falls off the top 100 pop albums chart, down from one week at No. 47, but remains at No. 1 country compilation albums for a second consecutive week, also falling off the physical sales and Scottish albums, down from No. 25 and No. 24, respectively. The vinyl collection of bonus tracks, Farther Along, rises five to No. 9 country compilation albums in its second week. Also on the country compilation albums chart, Emmylou Harris' Original Album Series: Volume 1 (with two Dolly covers, one track with Dolly harmony and one track with Trio harmony by Dolly and Linda Ronstadt) loses one to No. 20, Dolly's The Tour Collection dips one to No. 19 and Ronstadt's Original Album Series (featuring one Dolly cover and one track with Dolly harmony) re-enters the top 20 at No. 18. Stateside, the Hits Daily Double final sales estimates of the week put Dolly's album at just over 6,000 copies for its fifth week of U.S. sales, which would put it at about 53,000 copies since release here and let it be around No. 29 for overall album sales next week and around No. 7 country. The American charts will be released on Tuesday. Dolly's Pure & Simple Tour rolled through Washington State this week and glowing reviews continued. Check out what was said about her Seattle show from The Seattle Times here, Kent Reporter here and The Seattle Music Insider here and what was said about her Spokane show from The Spokane Inlander here and The Spokesman here. In related news, concert promoters at the Mosaic Place in Moose Jaw, Sask., where she played Sept. 13, revealed that she broke the venue's all-time record for ticket sales with $502,535 to surpass Carrie Underwood's 2013 record of $483,000, The Moose Jaw Times reported here. Promoting the Cracker Barrel-exclusive version of her new album, the restaurant released its latest "Front Porch Series" video this week with Dolly and Lauren Alaina. Watch it here. In addition to the appearance on ABC's Jimmy Kimmel Live on Oct. 3 reported here a few days ago, Dolly has apparently also been booked on CBS's The Talk that same afternoon to talk about the album and tour. Coverage of the new "Forever Country" single that features Dolly along with 29 other artists performing "On The Road Again," "Take Me Home Country Roads" and "I Will Always Love You" continued this week with Billboard telling the story of how it came together and producer Shane McAnally not planning originally to include Dolly's classic but "everyone" kept telling him it was the quintessential country song and needed to be used. Read that piece here. And he told the Associated Press Dolly was the only one of the 30 artists on the project who intimidated him. Read that one here. An Associated Press video of Dolly and Emmylou Harris talking about the Trio projects has been made available by The Hartford City News Times here. Dolly is among the Tennessee celebrities participating in the University of Tennessee's Game Face initiative to support the Pat Summit Foundation to combat Alzheimer's disease. Watch the video that includes her here. The full Oct. 1 Billboard charts were revealed on Tuesday and Dolly's Pure & Simple saw a major resurgence up north, re-entering the top 100 Canadian pop albums charts, presumably thanks to coverage of the Canadian dates on her tour of the same name, to come in at No. 36 for a third chart week. Elsewhere, the set loses 31 places to No. 108 U.S. pop in its fourth week, also sliding two to No. 6 country, four to No. 7 Americana/folk albums, 15 to No. 36 overall album sales, 16 to No. 36 top current albums and off of the Internet albums sales chart, down from No. 9. The Complete Trio Collection Deluxe debuts at No. 124 pop, No. 8 Americana/folk albums, No. 7 country albums, No. 40 overall sales, No. 13 Internet sales and No. 39 current album sales, while My Dear Companion: Selections From The Trio Collection debuts at No. 44 country albums. The multi-artist cover of "On The Road Again," "Take Me Home Country Roads" and "I Will Always Love You" under the title "Forever Country" and featuring Dolly debuts at No. 39 country airplay. The song is credited on the charts to "Artists of Then, Now & Forever." Dolly Parton's Christmas Of Many Colors: Circle Of Love will hit stores on DVD Dec. 20, just three weeks after its Nov. 30 premiere on NBC, it was announced Tuesday. The Warner Brothers Home Entertainment DVD will feature the movie, deleted scenes and three featurettes: a behind-the-scenes making-of feature with interviews called Dolly Parton's Christmas Of Many Colors: A Story Of Love, Sacrifice and Giving as well as Tiny Tasseltop and 1955: A Snapshot in Time. As has been previously reported, Dolly narrates the story similarly to last year's Dolly Parton's Coat Of Many Colors but also has a cameo as the "painted lady" after whom she modeled her look. It will have a $20 suggested price. Program your DVR to record Dolly on ABC Oct. 3 as she has booked an appearance on the network's Jimmy Kimmel Live program in Los Angeles the night after her two-night engagement at The Hollywood Bowl. Dolly apparently wowed Vancouver, B.C., as she wrapped up the Canadian leg of her Pure & Simple Tour on Monday night. Glowing reviews were published by Exclaim here and The Vancouver Sun here. The Vancouver Sun also previewed the concert by digging into its archives to find a review of her stealing the show when she made her debut in the city in 1972 as the girl singer for Porter Wagoner's tour when it stopped there. Check out that story here. Also, Clerks actor/director Kevin Smith shared his photo of meeting Dolly at the show here. The tour continues back in the U.S. in the Seattle area Wednesday and Spokane on Thursday. Dolly got her first-ever entry Tuesday on the urban myth-busting website Snopes. The piece centered on a recent false article on a right-wing "clickbait" website that has in recent days been shared thousands of times by other alt-right websites and facebook pages claiming that she had once loved Hillary Clinton but now had a change of heart and now thinks Clinton is "nuts," her campaign is "crazy" and that she's unfit to be a candidate for president, followed by several paragraphs of insults aimed at the Democratic nominee. Snopes called the claims "mixed" in their truth because she joked in a CNN interview while laughing that Clinton and Donald Trump were "both nuts" and that the entire presidential campaign has been "crazy" and that she never said any of the other negative things about Clinton that the article referenced. See the Snopes entry here and check out coverage of the entry from The Knoxville News Sentinel here. The "Forever Country" mash-up single music video premiered Tuesday night, with Dolly wrapping up the star-studded clip as its grand finale. Check out the video here. Early SoundScan data on Monday showed Dolly's Pure & Simple sold more copies last week than the preliminary Hits Daily Double building charts indicated. Instead of selling fewer than 4,000 units and possibly dropping out of the top 10, the CD sold 6,100 copies in its fourth week to slip only two spots to No. 6 country – giving it cumulative sales of 46,700 in the U.S. since release – while The Complete Trio Collection Deluxe with Emmylou Harris and Linda Ronstadt sold 5,200 copies in its first week to debut at No. 7 country and My Dear Companion: Selections From The Trio Collection will debut much lower due to selling just 800 copies. The Country Music Association will preview the official music video for "Forever Country," the mash-up of "I Will Always Love You" with "On The Road Again" and "Take Me Home Country Roads" featuring 30 different stars, including Dolly, with a sneak peak during ABC's Dancing With The Stars on Tuesday night. Immediately afterward, the full-length video will premiere online here. The Stranger on Monday offered "An Appreciation of Dolly Parton: America's Greatest Living Artist." Read what they had to say here. The viral nature of Dolly's "Jolene" cover with Pentatonix continued on Monday, with the count passing 7 million views in just over three days. Watch it again here. Jennifer Nettles on Monday formally announced the Oct. 28 release of her upcoming holiday album To Celebrate Christmas, which as was previously reported will include "Circle Of Love," a new tune written by Dolly for Nov. 30's Dolly Parton's Christmas Of Many Colors: Circle Of Love starring Nettles as Dolly's mother. The set will also feature guest vocals by Andra Day on "God Rest Ye Merry Gentlemen" and Idina Menzel on "Little Drummer Boy." Reserve your copy here. Dolly's new cover of "Jolene" with a capella group Pentatonix has gone viral. The single was released Friday and within 24 hours had seen more than 2 million views on YouTube. Various media outlets and online aggregates continued to share and promote the video over the weekend and it passed 5 million YouTube views by 48 hours after release, and the download was No. 26 at Amazon here and No. 24 at iTunes. It is possible if sales and streams continue for a few days that Dolly could have her first top 40 pop chart single since 2005's "When I Get Where I'm Going." Watch the video again here or in the media player above. My Dear Companion: Selections From The Trio Collection by Dolly, Emmylou Harris and Linda Ronstadt sees some big sales Down Under for its first week, debuting at No. 3 pop, No. 1 country and No. 8 digital albums in Australia. In its fourth week, Dolly's own Pure & Simple loses seven places to No. 25 pop and two to No. 6 country albums in Australia. The Canadian leg of Dolly's Pure & Simple Tour wraps on Monday night in Vancouver before she returns to this side of the border, and the shows up north have drawn universal praise and acclaim. The only criticism thus far is that flash flooding from rain caused the main exit to be closed for her Saturday show in Edmonton, causing confusion among audience members trying to leave. Check out a story from The Edmonton Sun here as well as stellar reviews from The Edmonton Journal here and Gig City here. Friday night's engagement in Calgary got top marks from both The Calgary Herald here and The Calgary Sun here. NBC's The Voice premieres for the new season with new judge Dolly goddaughter Miley Cyrus Monday night and Miley shared a clip on The Tonight Show With Jimmy Fallon that includes an appearance-by-videotape of Dolly trying to woo a contestant to choose Miley as her mentor. Check it out here. I'm told Dolly made Ozzy and Jack Osbourne's new travel show this week. While the two were touring a museum of human body parts, Ozzy received a text message, to which he declared "It's my old friend Dolly Parton," and she sang him "Happy Birthday." 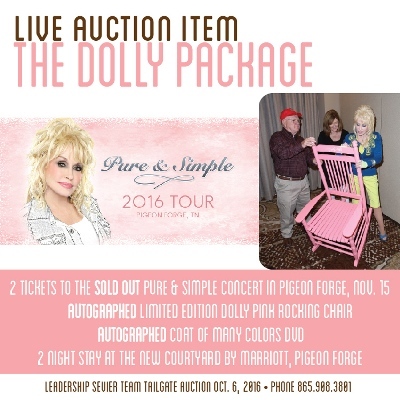 Dolly is lending a helping hand to her home county's future leaders with a nice package donation to Leadership Sevier's Team Tailgate fundraiser Oct. 6 at Pigeon Forge's Riverstone Resort. 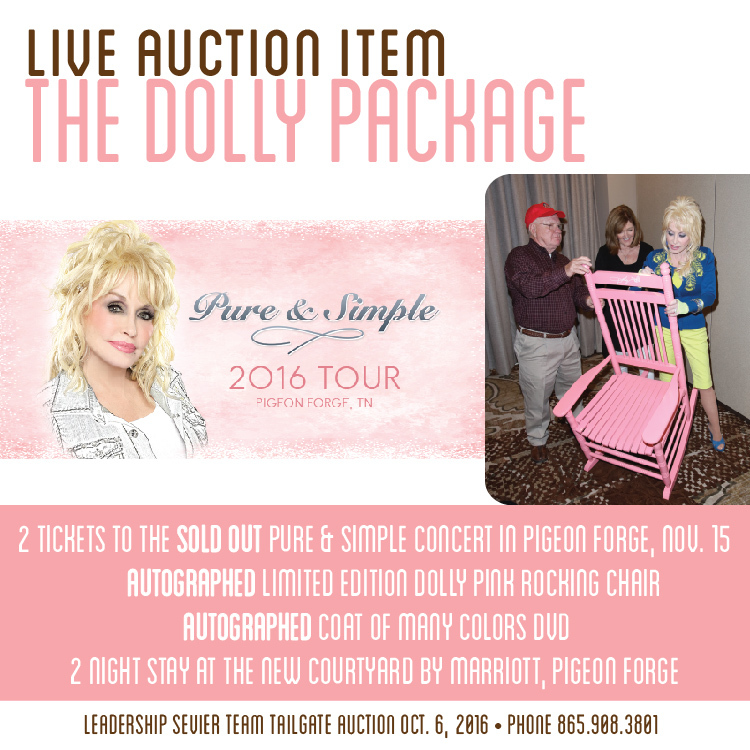 Tickets are $25 each and the Dolly package as part of the live auction includes two seats to her sold out Nov. 15 Pigeon Forge concert, an autographed Cracker Barrel Dolly pink rocking chair, an autographed Dolly Parton's Coat Of Many Colors DVD and two nights at the new Courtyard by Marriott in Pigeon Forge. Check out the event's Facebook page here or call 865-908-3801 for more information. Three different Dolly singles hit this week: the Pentatonix collaboration with Dolly on "Jolene" (which Dollymania.net one week ago appears to be the first media outlet anywhere to reveal) was released Friday for download here as well as a video for it from Cracker Barrel viewable in the media player above or by visiting YouTube here; Dolly Records and Sony Nashville released Dolly's "Head Over High Heels" from Pure & Simple as a single and issued a lyric video available from Vevo here or in the media player below; and the Country Music Association on Friday released its 30-artist mega-mash-up of "Take Me Home Country Roads," "On The Road Again" and "I Will Always Love You" with Dolly singing the closing lines. Listen to it on Spotify here and SoundCloud here or download it here. ABC's Good Morning America gave a behind-the-scenes of the making of the song here. After three consecutive weeks at No. 1 country albums in the U.K., Dolly's Pure & Simple last week moved about 4,000 units (giving it about 34,000 copies sold in the U.K. since release) to slide one to No. 2 country in its fourth week. The album loses 10 places to No. 21 British pop albums, five to No. 14 overall sales, six to No. 12 physical CD sales, and five to No. 12 Scottish albums, while it falls off the top 100 downloads tally, down from No. 78. Also in the U.K., The Very Best Of Dolly Parton, Volume 1 falls off the top 100 overall sales and physical CD sales lists, down from No. 89 and No. 75 respectively, while The Real Dolly Parton gains 13 to No. 86 physical CD sales. With 1,851 copies sold in its first week, The Complete Trio Collection Deluxe debuts at No. 1 country compilation albums, No. 47 pop albums (which combines sales and online streaming), No. 25 physical sales and No. 24 Scottish albums, while the vinyl collection of bonus tracks, Farther Along, debuts at No. 14 country compilation albums. Also on the country compilation albums chart, Emmylou Harris' Original Album Series: Volume 1 (with two Dolly covers, one track with Dolly harmony and one track with Trio harmony by Dolly and Linda Ronstadt) dips three to No. 19 and Dolly's The Tour Collection drops three to No. 18. Stateside, the final Hits Daily Double charts show Dolly's Pure & Simple is no longer in the top 50 album sales, indicating fewer than 4,000 copies sold in its fourth week, which could place it around No. 10 country when the charts are released on Tuesday. Meanwhile, the Pure & Simple Tour's Canadian segment continues with coverage from The Winnipeg Free Press here of how she gave her hotel room at the Radisson Hotel to a homeless man she saw outside as she passed by with her bodyguards. Live In Limbo reviewed her Sept. 9 show in Toronto here and interviews were seen in The Edmonton Journal here, Straight here, The Calgary Herald here and The Spokesman here. Metro News spoke with an artist who made a different piece of Dolly art each day for the 30 days leading up to her Calgary concert on Friday night here. FOX News interviewed her here and Cracker Barrel this week released the next installment of its "Front Porch Series" with Dolly, this one with Kelsea Ballerini, here. Dolly's goddaughter Miley Cyrus spoke of her godmother and their relationship on NBC's Today show Friday. Check out a clip here. Billboard on Tuesday released the full Sept. 24 U.S. charts. As was predicted by the Hits Daily Double sales numbers, Dolly's Pure & Simple loses two to No. 4 country in its third chart week. The album slips eight spots to No. 21 overall sales, compared to the Hits projection of No. 25, also sliding seven to No. 20 current albums. On the top 200 pop albums list that adds in online streaming, the release falls 43 digits to No. 77. After two weeks at No. 1 Americana/folk albums, the CD loses two to No. 3, and it gains one to No. 9 Internet sales for the week. In Canada, the set falls off the top 100 pop albums chart, down from No. 60, while Best Of Dolly Parton Collections also falls out of the top 100, down from No. 85. After two weeks on the Artist 100 chart, Dolly falls off of there, too, down from No. 91. SoundScan data for fourth-week album sales show it moved 7,700 copies in the U.S., giving it cumulative American sales of 40,600 since release. Meanwhile, The Winnipeg Free Press had her on the front page Tuesday with a glowing review of Monday night's show here from the Pure & Simple Tour. And the preliminary Hits Daily Double sales numbers that started coming out Tuesday night have the album down at present to No. 34 overall sales, No. 7 country, for its fourth week. Sales updates will continue through Friday and the official charts will be out next Tuesday. The Country Music Association on Tuesday revealed the secret behind the Forever Country 50 website: a 30-artist mega-song combining "On The Road Again," "I Will Always Love You" and "Take Me Home, Country Roads" in honor of the CMA's 50th anniversary. The song ships to radio on Friday and the music video for it drops Sept. 20. Read more from CMT.com here. In related news, Casey Musgraves on Tuesday became the latest voice to be added to the "I Will Always Love You" segment. Dolly's first album, Hits Made Famous by Country Queens, a 1963 release on Somerset Records where she sang half the songs – most of which were Kitty Wells covers – and Faye Tucker sang the other half, has been remastered from the original master tapes and was re-issued on CD Tuesday. Get your copy here! Dolly's Pure & Simple Tour on Monday added a 15th date to the fourth and final leg of the tour: Nov. 19 at Time Warner Cable Arena in Charlotte, N.C. VIP packages start at 10 a.m. Eastern Wednesday and a Ticketmaster presale begins at 10 a.m. Thursday, while regular ticket sales start at 11 a.m. Friday via Ticketmaster. She spoke with The Edmonton Journal here in advance of Saturday's show there. And The Winnipeg Free Press posted an interview here before Monday's concert there. Vice's "Noisey" magazine provided a great interview introduced with the phrase: "In a world perpetually rent by war, famine, and golems of outright hatred, Dolly Parton is a shining beacon of glitter, grit, and pure love—a veritable rainbow in the dark." The piece also notes she sings two new Christmas songs in the NBC Christmas In Rockefeller Center including "a riff on her classic 'Coat Of Many Colors.'" Read more here. Mid-week sales numbers across the pond indicate The Complete Trio Collection Deluxe will debut at No. 25 pop albums in the U.K., the preliminary charts released Monday showed. In related news, Sounds Like Nashville reviewed the collection here. Dolly on Monday reacted to the news that Dollywood had earned four first place honors at this year's Golden Ticket Awards, as was reported here Sunday night. In a press release, she said: "I'm so very proud of the experience families have when they come visit my Dollywood. While they're here having fun with us, I want them to create those special heartfelt moments they'll always treasure. I know it's our people who work here who help make those memories happen for them. Some people call it friendliness, but I just call it what it is—caring for others. Our folks show their love for families through the care they put in to everything they do—from our beautiful landscaping and that delicious food to makin' sure each guest leaves with a smile on their face. I'm very proud of the way Dollywood has grown, but I'm most proud of my Dollywood team who goes above and beyond to give families memories they'll share forever." Carrie Underwood is the latest artist added to the Forever Country 50 website singing a line from Dolly's "I Will Always Love You." Watch it on their website. The third leg of Dolly's four-leg Pure & Simple Tour kicked off on Friday across the border in Canada. I'm told her Toronto set list was very similar to the tracks in her first two legs with the notable changes of adding "Better Get To Living" after the Fire Medley and changing "Hello God"/"He's Alive" for "Light Of A Clear Blue Morning"/"Better Day" as her second optional encore. The Toronto Sun had a review here, while photos from Saturday's engagement in Sault Ste. Marie were posted by SOO Today here and Sault Online here. The tour continues in Winnipeg on Monday, Moosejaw on Tuesday, Calgary on Friday, Edmonton on Saturday and Vancouver next Monday before crossing back into the States for her West Coast dates through the start of October. The tour's fourth and final leg then starts in mid-November. For its third week Down Under, Dolly's Pure & Simple loses three spots to No. 18 pop and remains steady at No. 4 country albums in Australia. Meanwhile, her album received reviews from The Deccan Herald here and The South China Morning Post here. And as part of Cracker Barrel's promotions of its exclusive version of the album, the restaurant has released its second installment in its "Front Porch Series" with Dolly, this one featuring newcomer RaeLynn. Watch it here. Friday's release of The Complete Trio Collection Deluxe garnered an 11-minute segment interviewing all three ladies for Australia's Sunday Night viewable here. The album received a four-out-of-four-star rating from Buffalo.com here and four-out-of-five-stars in Britain's Express here. Dolly was added over the weekend to the teasers for the Country Music Association and Country Music Hall of Fame 50th anniversary celebration website, "Forever Country 50" here, which has been promoting a mysterious Sept. 20 date and various clips of stars performing a line or two of famous songs. As was previously reported, Reba and Trisha Yearwood had appeared thus far with portions of Dolly's "I Will Always Love You," with Dolly now added. Dolly's official Facebook page shared the clip here. Amusement Today on Saturday at Cedar Point announced this year's winners of the Golden Ticket Awards and Dollywood once again was the most-nominated amusement park in the world, garnering four first place awards and nine top five finishes, just one category shy of the awards' all-time record which the park set with 10 top five finishes in 2014 and 2015. First place awards were received for Best New Ride for Lightning Rod, Friendliest Park (its fifth consecutive first place win in the category), Best Shows (its eighth consecutive first place win in the category) and Best Christmas Event (its ninth consecutive first place win in the category). The park ranked No. 3 on the list of the world's best parks behind No. 1 Europa-Park in Germany, No. 2 Cedar Point in Ohio, up from No. 4 last year, while its Splash Country Water Park ranked as No. 3 best water park in the world, the same as last year. It ranked No. 2 for Cleanest Park and Best Food and No. 4 for Best Landscaping. Thunderhead fell two places to No. 7 for Best Wooden Roller Coaster, while Wild Eagle dropped five places to No. 36 Best Steel Roller Coaster. Lightning Rod debuted at No. 11 for Best Wooden Roller Coaster, the highest placing this year for any new coaster, wooden or steel. A capella act Pentatonix has announced they have covered Dolly's classic "Jolene" complete with guest vocals by Dolly herself to come out next week. The single, available here or here, will be available next Friday from RCA Records. The band won the third season of NBC's The Sing-Off. Dolly's Pure & Simple sold 5,164 copies in the U.K. in its third week, bringing its total since release there to just over 30,000 copies. The sales were enough to stay at No. 1 country for a third consecutive week there, although it slides seven spots to No. 11 pop albums. The album tumbles 42 places to No. 78 downloads but only loses six to No. 9 overall sales and four to No. 6 physical CD sales, while dropping four to No. 7 Scottish albums. The CD falls off the top 100 Irish pop albums list, down from No. 88 in its second week. Back in the U.K., The Very Best Of Dolly Parton, Volume 1 loses 30 places to No. 89 overall sales and 23 points to No. 75 physical CD sales, while The Real Dolly Parton drops 20 to No. 99 physical CD sales. On the country compilation albums chart, Emmylou Harris' Original Album Series: Volume 1 (with two Dolly covers, one track with Dolly harmony and one track with Trio harmony by Dolly and Linda Ronstadt) falls three to No. 16 and Dolly's The Tour Collection gains two to No. 15. Stateside, the final Hits Daily Double charts estimate that Dolly's new CD sold just under 6,000 copies in its third week in the U.S., which would push it down two places to No. 4 country and around No. 25 overall sales, down from No. 13 in its second week, but its low streaming numbers should fall out of the top 50 pop albums chart, down from No. 34. The official American charts will be released on Tuesday. With her Pure & Simple Tour having started back up on Friday in Toronto, Metro News spoke with some younger folks in the city about the show here. And Cracker Barrel announced a new contest to win a trip to Dallas to see Dolly in concert and meet her at the show. Enter here. Finally, reviews of the album made Kenosha News here and nine-out-of-ten stars from Glide here. With Friday's release of The Complete Trio Collection Deluxe, promotions continued with articles from AOL's The Boot here and The Huffington Post here. Dolly's Imagination Library charity license plate in Tennessee has passed the 1,000-unit minimum and will begin production, it has been announced. Get yours here and check out an update from WBIR here. Designer Jeremy Scott (who was a guest judge this week on RuPaul's Drag Race) spoke this week with Billboard about his work with music stars, including Katy Perry, who introduced him to Dolly at this year's ACM Awards, and he tells the story here. Billboard on Wednesday released the full Sept. 17 U.S. charts. As previously reported, Dolly's Pure & Simple slips one to No. 2 country. As the Hits Daily Double charts predicted, the album loses seven to No. 13 overall album sales and No. 13 top current albums, although it falls a little further than expected on the streaming-inclusive top 200 pop albums chart, dropping 23 places to No. 34 instead of the Hits-predicted No. 29. It maintains its No. 1 ranking for a second consecutive week on the Americana/folk albums tally. Also, the CD falls off the 25-position digital albums list, down from No. 10, and drops four to No. 10 Internet albums. In Canada, the set loses 40 spots to No. 60 pop, while Best Of Dolly Parton Collections re-enters the top 100 at No. 85 pop to earn a second week. Dolly gets a second week on the Artist 100 chart, falling 45 digits to No. 91. Her "Where I Get Where I'm Going" with Brad Paisley falls off the 50-position digital singles sales and Christian and gospel digital singles charts sales after 21st and 13th weeks, respectively, down from No. 45 and No. 47. Don Henley's Cass County, featuring the Dolly duet "When I Stop Dreaming," falls back off the 50-position country albums chart, down from No. 50 in its 41st week. In other news, as part of the album's promotions Dolly gets her own show on Australia's Smooth radio at 4 p.m. Sunday, Radio Info reported here. An interview popped up with The Sault Star here, a top 40 musical moments proving she is "a groundbreaking genius" was posted by OMG here and a profile of her feminist ways in advance of her Toronto show on Friday made Now Toronto here. Fans in the Nashville area will want to check out an exhibit at the Hatch Show Print's Haley Gallery focusing on limited edition monoprints of artwork from the vinyl release of Farther Along as part of The Complete Trio Collection Deluxe. The work shows for free through the end of the month. Learn more here. In related news, The Irish Times gave the boxed set four-out-of-five stars in a review here. Something is brewing with the Country Music Association and/or Country Music Hall of Fame, both of which are celebrating their 50th anniversary this year. The two are marketing the benchmark under the title "Forever Country 50," and a website under that name has launched here promoting a Sept. 20 date and various clips of male singers performing a line each from John Denver's "Country Roads" and female singers (thus far Reba and Trisha Yearwood) performing Dolly's "I Will Always Love You." More details will be reported as they become known. Although the full charts won't be out until Wednesday thanks to the holiday, the early release of the country list confirms Dolly's Pure & Simple will lose one spot to No. 2 U.S. country albums for its second week with about 12,800 copies sold. Preliminary sales data being collected for the album's third week of release had it as of Tuesday slipping to around No. 6 country, No. 32 overall sales and No. 48 pop for combined sales and streaming listens and probably will sell between 6,000 and 8,000 copies for the week. Those estimated charts will be finalized on Friday, although the official charts won't be out for another week. Meanwhile, Cracker Barrel on Tuesday released its first full-length "Front Porch Series" video with Dolly to promote her exclusive version of the album in their stores, this one with singer Cam. Watch it here or in the media player above. In related news, CNBC promoted its recent interview here and in advance of the Canadian leg of her Pure & Simple Tour starting on Friday, Canada's Exclaim offered an "essential guide to Dolly" here. American Songwriter loves the new boxed set The Complete Trio Collection Deluxe, coming out this Friday, giving the collection five-out-of-five stars in a review here this week. Jezebel on Tuesday provided an overview of this past weekend's massive party Dollypalooza in New York. Read it here, and if you're on the West Coast, the party heads your way Oct. 29 at Los Globos. Dollywood has taken Lightning Rod out of testing and put it back into regular ride condition, and NBC News took notice, giving the world's fastest wooden roller coaster its own segment on the nightly news Monday. Check it out here. Chase Holfelder, who has found YouTube fame reworking popular and classic major key songs into minor keys, giving them a haunting sound, this week took on Dolly's "I Will Always Love You," imbuing it with significant pain and anger. Watch his cover here. Dolly's Pure & Simple sold 40,000 copies in its first week of release, making it that week's No. 9-selling CD worldwide, according to the World Albums Chart released over the weekend by Media Traffic. Given that it moved 20,200 in the U.S. in its first week and just under 16,800 in the U.K., that means it sold about 3,000 copies outside of those two countries. For its second week, the album slides six places to No. 15 pop and three spots to No. 4 country albums Down Under in Australia. The CD falls out of the 50-position digital albums tally there, down from one week at No. 20. According to the British charts, the album sold 8,447 units in the U.K. in its second week; adding that to the estimated U.S. sales for the second week at the album has moved a total of about 62,000 copies worldwide in two weeks. Entertainment Focus has a four-out-of-five stars review of the album here. In other promotional appearances that came out over the weekend, Dolly was interviewed by Hard Rock about her first encore here and she discussed her muses with The Guardian here. Fans are now just four days away from the much-anticipated release of The Complete Trio Collection Deluxe, and another interview about the project has come forward, this one from AXS. Read it here. Some fans, however, reported the project being out early at some retailers. As a reminder, The Complete Trio Collection Deluxe is a three-CD set with 20 bonus tracks, most of which are previously unreleased, while the same day also sees the release of My Dear Companion: Selections From The Trio Collection, a one-CD version, as well as the vinyl release of Trio II and Farther Along, consisting of the 20 bonus tracks. Farewell to longtime British Dolly fan website Dolly Part'ners UK, which webmaster Joe Skelly has announced is closing now that he feels Dolly's new official website, DollyParton.com, is adequately updated. Joe has served fans across the pond well for many years. I'm sure they're sorry to see him close his site. Second-week sales figures of Dolly's Pure & Simple have started to come in. In the U.S., the final estimates from Hits Daily Double show the album sold about 13,400 copies – a 36 percent decrease from its first week – but that should be enough for the album to lose just one spot on the country albums chart to No. 2 behind Florida Georgia Line and to fall to around No. 13 for overall sales (down from No. 6), but with very few streams to add to its credits for the pop charts, it appears it will tumble about 18 digits to around No. 29. On the British charts, the album slips two to No. 4 pop, one to No. 3 sales, one to No. 2 physical CD sales, one to No. 3 Scottish albums and 28 places to No. 36 download albums, holding onto the No. 1 country position for a second week. Nearby in Ireland, the album loses 55 spots to No. 88 pop in its second week. Elsewhere on the British tallies, The Very Best Of Dolly Parton, Volume 1 re-enters the top 100 pop albums chart at No. 96. Dolly celebrated her No. 1 album status by releasing a video on Friday viewable in the above media player or here. The album and tour promotions continue with an appearance on CNBC's On The Money -- watch the video here -- at 5:30 a.m. Saturday (and repeats on Sunday morning on various NBC stations) and the syndicated Steve Harvey Show on Thursday. An internet interview with Katie Couric was released Thursday on Yahoo here. Forbes took notice of her No. 1 here Friday, and The Knoxville News-Sentinel reviewed the album here, calling it Dolly's most "lustful" album of her career. Continued coverage of Dolly's Parade of Many Colors announcement at Dollywood popped up this week from WCYB here, The Times News here, WVLT here and Nashville's News Channel 5 here. Little Big Town was on The Grand Ole Opry this week and offered up a cover of Dolly's "Jolene." Watch it here. Dolly was at Dollywood Wednesday night to film some scenes for her Nov. 30 NBC movie Christmas Of Many Colors: Circle Of Love, but it also gave her an opportunity to make a seven-minute appearance earlier in the day before a small group of local television and newspaper reporters to announce the park's holiday additions to this year's Smoky Mountain Christmas: a $2.5 million new lighted parade, the Parade Of Many Colors, and a new It's A Wonderful Life play. "The joy I feel during the Christmas season makes my heart sing because of the love and sweet Christmas memories I have of family and friends from when I was a child," she said in a statement released afterward. "Christmas is the time of year when traditions, faith and family come together to create experiences we all remember forever. That is why my new movie and this parade are so important for me. I truly believe The Parade of Many Colors will inspire some of those same lifelong memories for the families who see it." A Smoky Mountain Christmas runs Nov. 5 to Jan. 1. Check out footage of Dolly's appearance from Knoxville TV station WBIR on Facebook in the media player above or here. Additional coverage of the announcement is available from WBIR here, WATE here and The Knoxville News-Sentinel here. Dolly, Linda Ronstadt and Emmylou Harris were recently interviewed in a two-hour BBC Radio 2 special Johnny Walker Meets . . . , where the host chatted with them about their recordings together to promote the Sept. 9 release of The Complete Trio Collection Deluxe. Hear it (featuring several songs from the project -- including some previously unreleased ones) here! Promoting her tour and CD, Dolly got a new interview posted Wednesday from Canadian magazine Macleans here. Also, The Federalist gave 18 reasons why Dolly should be president here.